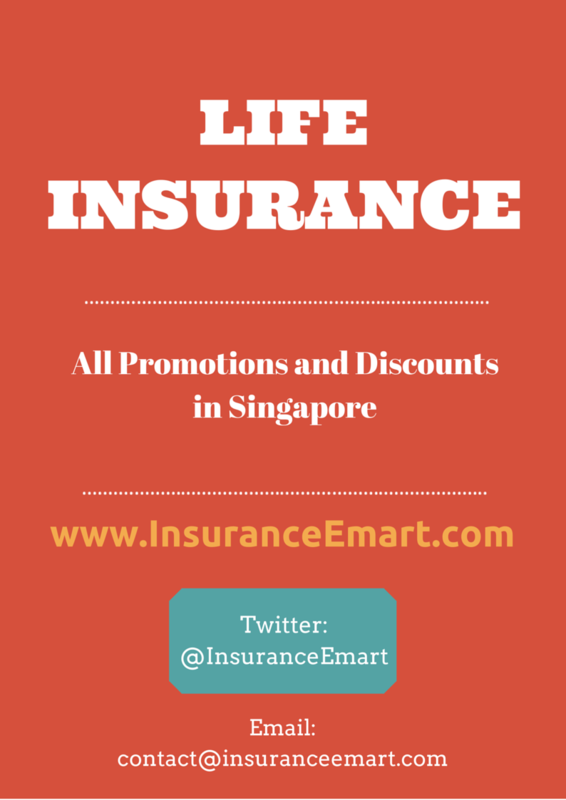 Insurance E-Mart: Life insurance discounts and promotions from all life insurers Singapore! 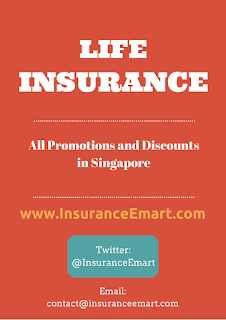 Life insurance discounts and promotions from all life insurers Singapore! But of course, while we try our best, please refer to the respective websites of the different insurance companies for information and details. to understand what is most suitable for you. Enjoy up to $108 annual cashback, and lifestyle discounts. Plus, up to 15% savings on your premiums as you get healthier. Promotion ends 30 November 2015. AIA Vitality saves you money with cashback and discounts as you get healthier. You can enjoy up to S$108 Annual Cashback, and discounts from gym memberships, airfares to health screening packages. Plus, up to 15% savings on your premiums as you get healthier, giving you more motivation to maintain a healthy lifestyle. That’s why our plans do more than protect you financially. They keep you healthy too. The existing 5% upfront premium discount is only applicable to first-year premiums based on standard life. Discount will not be applicable on any extra premiums due to loading. Discount applicable from the second policy year onwards will depend on the AIA Vitality Status attained. The existing 5% upfront premium discount is not applicable to AIA HealthShield Gold Max Essential. The additional 5% premium discount is only applicable to first-year premiums based on standard life and will not be applicable on any extra premiums due to loading. Promotion ends 30 November 2015. Parents of jubilee babies will receive 50% discount on 1st two years of insurance cover on AIA Secure Term Plus II. Jubilee babies will receive $110 to $200 worth of Robinsons Gift Card when you purchase Medisave-approved health insurance cover, AIA HealthShield Gold Max. Couples who tie the knot in 2015 will receive 50% discount on 1st two years on AIA Secure Term Plus II. 20% discount on premiums for a level term insurance plan with $1 million coverage and above. Promotion ends 31 October 2015. This Promotion is for purchase of Aviva’s MyProtector-Level Plus Policy (“Policy”) and its attaching riders. · Minimum basic sum assured of $1 million per Policy (in the contract currency) is required for the Policy to be eligible for the discount. · Where basic sum assured is subsequently reduced to below $1 million (in the contract currency), discount will be removed. · For customers who are purchasing a 5 year or 10 year renewable term, this Promotion shall be a one-off discount over their intended term (5-year or 10-year). Upon the renewal of their policy, this Promotion will no longer be valid. Premiums payable for renewal will be based on the prevailing premium rates at time of renewal. · Discount is given on a per Policy basis, subject to underwriting. · Discount is applicable to the end of premium payment term and will apply on new business as well as all subsequent renewal premiums. · The Promotion is valid for applications signed from 1 April 2015 to 31 October 2015 (both dates inclusive). Policy must be issued by 31 December 2015. 35% perpetual discount for a short and long-term disability replacement income protection plan. Promotion ends: 31 October 2015. The 35% perpetual discount Promotion is for purchase of Aviva’s IdealIncome Policy (“Policy”). · Applications must be received from 12 January 2015 to 31 October 2015 (both dates inclusive). Policy must be issued by 31 December 2015 to be eligible for the discount. · Minimum monthly payout of $3,000 is required to be eligible for the discount. · Where the monthly benefit is subsequently reduced to below $3,000, the discount will be removed. · Discount is given on a per policy basis, subject to underwriting requirements. $200 worth of Frasers Centrepoint Malls gift card for adding one or more of selected plans for existing Aviva Life or Health Policy, or a Navigator investment account holders. Promotion ends: 31 December 2015. · Applicant must be an existing customer of Aviva as at 30 June 2015 and is either an individual life or health policy holder (excluding ElderShield), or a Navigator customer. · The application for the Qualifying Product must be signed between 14 July 2015 and 31 December 2015 (both dates inclusive), and the policy must be issued by Aviva by 31 March 2016. Applications for the Qualifying Product must pass the 14 days free look period. MyCare / MyCare Plus – enhancements to ElderShield. Take S$100 off the premium. The discount voucher can only be used for the purchase of Aviva’s MyCare or MyCare Plus policy(ies). · A minimum premium of $500 per annum is required for the policy to be eligible for the use of the discount voucher. · One MyCare or MyCare Plus Application is entitled to only one discount voucher. Discount voucher is transferrable but cannot be combined. · For the eligibility of the discount, the voucher needs to be submitted together with a MyCare or MyCare Plus Application Form. · The validity of the discount voucher is from 1 Oct 2014 to 31 December 2015. Policy must be issued by 31 March 2016. · The discount voucher is applicable for a one time premium discount only. Enjoy 50% discount for new Personal Accident insurance premiums. Enjoy 15% off Term Protector, 10% off Early Stage CritiCare or Sign up for both and enjoy 20% off Early Stage CritiCare. This campaign is applicable for new applicants submitted from 16th July 2015 to 31st December 2015 and the application must be incepted by AXA Life Insurance Singapore Private Limited by 31st January 2016. Terms and conditions for 20% discount on the Early Stage CritiCare policy, if it is bought with eligible basic plans. Please refer to Early Stage CritiCare product brochure for more details. The Early Stage CritiCare policy needs to be purchased within 12 months from the date of application of the eligible basic plans. In the case where Early Stage CritiCare is submitted concurrently with a basic plan and the basic plan is not approved, Early Stage CritiCare will be offered at 10% discount. If any of the eligible basic plan is lapsed within 24 months from the date of inception, the 20% discount applicable for the policy will be withdrawn and the policy will be offered to the Policyholder at 10% discount. If the basic plan expires before the Early Stage CritiCare policy, the Early Stage CritiCare policy will continue at 20% discounted rate. Other existing terms & conditions on the application of the policy will apply for the discount. Riders for Term Protector are only eligible for discount if the application is submitted together with the basic plan. Singaporeans and PRs who purchase new Retire Happy savings and investment policies in 2015 will be able to enjoy $500 off their first year premium. If you are a new parent with a baby under a year old, or a newlyweds, you can get a free term life insurance plan with S$25,000 coverage for 12 months! Receive tickets to watch the Masters Football Asia match when you sign up for Supreme Retirement or Prime Retirement. Exclusive to SG50 Guaranteed Saver. Receive up to S$500 SG50 SSB Premium Vouchers and enjoy special savings when you purchase a new regular premium insurance plan. Promotion ends: 15 December 2015. SG50 ez-link card is limited to the first 3,000 qualifiers within the promotional period, with a minimum single premium of S$50,000. Please refer to paragraph 2 in the Terms and Conditions for “SG50 Special Saver Bundle (SG50 SSB) Promotion Premium Voucher” for the full list of qualifying plans and riders. Receive S$50 to S$1,000 in CapitaVouchers when you sign up for Smart Life Advantage plan – an investment-linked insurance plan. Receive $30 or $100 in CapitaVouchers when you sign up for a Personal Accident Protection plan. Sign up for any new regular premium plans (including selected protection plans and riders) of $300 and above, and receive $50 to $950 CapitaVouchers. Plus, get additional S$50 CapitaVoucher when you sign up for selected new protection riders or term plans with a monthly qualifying premium of S$50 or more. You can combine your monthly premiums to qualify for a higher value voucher as long as the policies purchased are for the same life assured. Great Eastern SG50 baby gift pack which includes free health coverage for a year (SupremeHealth A Plus plan, an integrated Shield plan), SG50 baby accessories and Live Great privileges. This insurance voucher gift (worth S$108 in value) can be used to purchase a SupremeHealth A Plus Plan ("Insurance Voucher") for all newborns born in Singapore in the year 2015. To qualify for this "Insurance Voucher" gift, the purchase of SupremeHealth A Plus Plan must be registered in Singapore and issued by the validity date as shown on the Insurance Voucher ("Validity Date"). Personal accident policy. Sum Assured $150,000 at only $15 per year. Enrol with spouse for 5% discount; spouse and kid for 10% discount. Tertiary graduate (2012 or later) can receive $1,000 cashback when signing up for any regular premium life policy with minimum annual premium of $2,000. CapitaMall vouchers equivalent to first year premiums when you sign up for a new Enhanced IncomeShield plan for your child. We’re celebrating with a difference, by making a difference. For all other new sign-ups, $100 CapitaMall voucher. For children aged 12 and below. Up to 9% additional premium allocation for the first year on PRUSelect Vantage (SGD) or PruSelect Vantage (USD) – investment-linked insurance policy. ^ Premium Allocation Rate for the first year refers to the percentage of the regular premium that is invested in the first policy year. Enjoy up to 30% off first year premiums when you purchase a PRUTerm Vantage (SGD or USD) with supplementary benefits. For Tokio Marine Life Insurance customers whose policies are maturing from 1 October 2015 onwards. Be rewarded with Takashimaya shopping vouchers when you sign up for a new Tokio Marine Life Insurance plan today. Only applicable for annual premium payment mode. Excludes premium payment term of less than 5 years. For cash policies only. Excludes policy term of 5 years or less.